Gravelly Point and Long Bridge Park are small parks in Arlington, VA, located along the George Washington Memorial Parkway, just north of Washington's Ronald Reagan Washington National Airport. With their prime locations, across the Potomac River from Washington, DC, the parks are both popular spots for watching the National Mall 4th of July Fireworks. Due to their close proximity to the airport, people often walk along the grassy areas to view the low flying airplanes. Gravelly Point Parking Lot is also widely used by bicyclists throughout the year to access the 18-mile Mount Vernon Trail. Parking is free and the lot can be quite busy on the weekends during the warmer months of the year. Note: Gravelly Point is only accessible heading North on the GW Parkway. 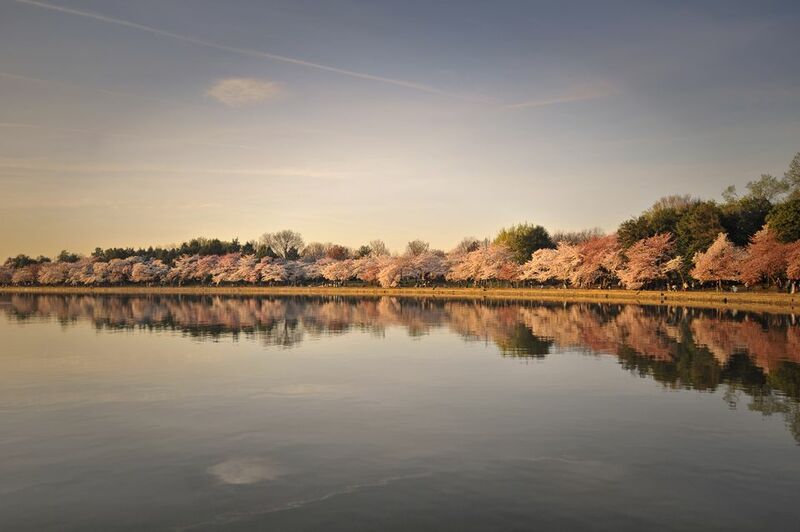 Long Bridge Park is a 30-acre public green space with outdoor recreation facilities including turf athletic fields, a network of walkways, an overlook at the north end of the park with views of the monuments and memorials in Washington DC. There are picnic areas, interpretive displays, restrooms, and parking. There's also "Wave Arbor," a wind-activated kinetic sculpture by Douglas Hollis. Parking is metered Monday-Friday. From Maryland - Take I-495 South to Exit 43-44 for VA-193 / the George Washington Memorial Pkwy toward Washington DC. Continue on the GW Parkway towards Ronald Reagan National Airport. You can not access the park from this direction and will have to pass the entrance and exit at the Airport. Follow the signs to return to the GW Parkway North. Turn right into the parking lot. From Downtown Washington DC - Cross the Potomac at the 14th Street Bridge. Follow the signs to take the George Washington Parkway South towards Ronald Reagan National Airport. Pass Gravelly Point and exit at Ronald Reagan National Airport. Follow the signs to return to the GW Parkway North. Turn right into the parking lot. From Virginia - From the George Washington Parkway, head north towards Washington DC. Just after the exit for Ronald Reagan National Airport., turn right into the parking lot. From Maryland - Take I-495 South to Exit 43-44 for VA-193 / the George Washington Memorial Pkwy toward Washington DC. Continue on the GW Parkway to Boundary Channel Drive in Arlington. Take Exit 9 from I-395 South. Turn right on Long Bridge Drive. From Downtown Washington DC - Take 14th St NW to I-395 South. Take the I-395 S Exit, Continue on I-395 S to Arlington. Take exit 9. Turn right on Long Bridge Drive. From Virginia - From the George Washington Parkway, head north towards Washington DC. Take US-1 North. Take Exit 10A-10B. Continue onto Long Bridge Drive. 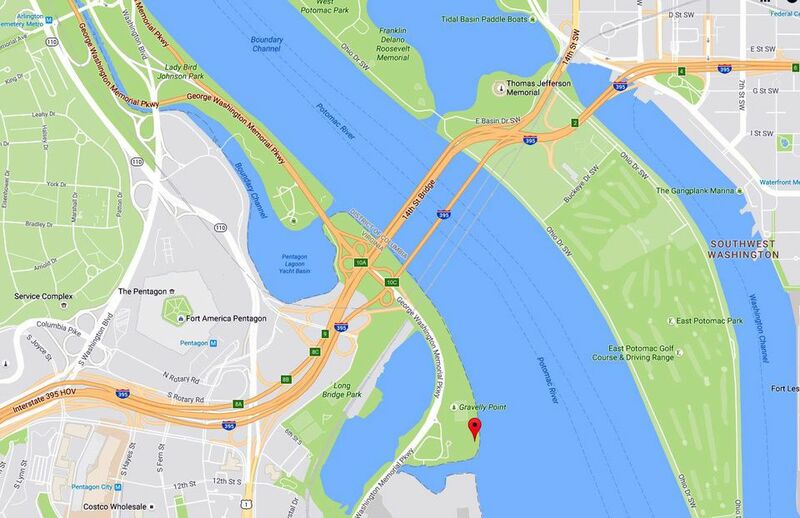 This map shows the locations of Gravelly Point and Long Bridge Parks in Arlington, VA near Washington DC.